Human Services– We understand the environments people live in have a direct impact on their health and wellbeing. Therefore, we also have an interest in supporting organizations and programs that create environments that promote good health. Moses Taylor Foundation is based in Scranton, Pennsylvania and has a primary interest in Lackawanna County. 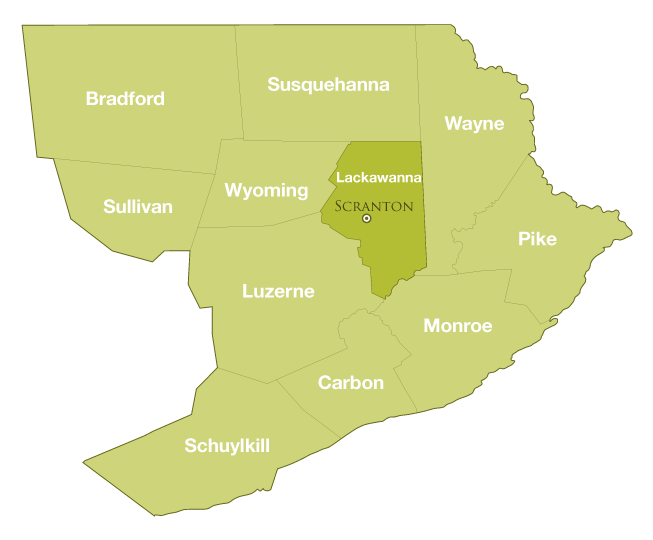 Additionally, the Foundation serves the following Northeastern Pennsylvania counties: Bradford, Carbon, Luzerne, Monroe, Pike, Schuylkill, Sullivan, Susquehanna, Wayne and Wyoming. The Foundation makes operating grants, program grants, capital grants and capacity building grants. Discretionary Grants up to $20,000 have an abbreviated proposal and are reviewed on a rolling basis to respond quickly to community need. Grant proposals above $20,000 must be submitted for one of the Foundation’s quarterly deadlines. Applicants must have a 501c3 and serve people within Northeast Pennsylvania. The Foundation does not fund individuals, religious organizations for religious or evangelical purposes, fundraising events, endowment funds, research, debt retirement or lobbying. Already have an account or started / saved an application? Log into your account to access saved and submitted requests by clicking here.